Okinawa, Japan, July 25, 2011- A coral genome has been decoded for the first time by the Marine Genomics Unit at the Okinawa Institute of Science and Technology (OIST). This study was published on July 24, 2011 in the online version of the British scientific journal Nature and featured in Nature News. Many corals are dying from bleaching attributed to global warming. In addition, emissions of carbon dioxide are contributing to ocean acidification, which threatens the hard skeleton of coral. In 1998, corals in Okinawa waters and around the world suffered bleaching, resulting in the death of many of them. Decoding the coral genome does not immediately identify the cause of bleaching, but it facilitates analysis of the bleaching mechanism from different aspects. Despite the enormous ecological and economic importance of coral reefs, the keystone organisms in their establishment, called the scleractinian corals, increasingly face a range of anthropogenic challenges including ocean acidification and seawater temperature rise. To better understand the molecular mechanisms underlying coral biology, a team of researchers led by Dr. Noriyuki Satoh at OIST has successfully decoded the approximately 420-megabase-pair genome of the coral Acropora digitifera using next-generation sequencers at the OIST Technology Center. Acropora digitifera is a dominant coral species in Okinawan reefs (see picture A), and among the most sensitive of corals to the rise in seawater temperature. This genome contains approximately 23,700 gene models. The success in deciphering the Acropora digitifera genome has led to five findings. The analysis of hereditary molecular differences between corals and other Cnidarians, a group of aquatic animals that includes jellyfish, corals, sea anemones, and hydras, indicates that the coral and its close relative the sea anemone Nematostella vectensis diverged approximately 500 million years ago – considerably earlier than the time over which modern corals are represented in the fossil record. Corals are often associated with microscopic photosynthetic organisms, called dinoflagellates of the genus Symbiodinium, which live within the cells of the coral, a process known as endosymbiosis. Despite the long evolutionary history of this endosymbiosis, no evidence was found for horizontal transfer of genes from symbiont to host. Unlike several other corals, Acropora digitifera was found to be lacking cystathionine ß-synthase, an enzyme essential for cysteine biosynthesis. This implies that the coral depends on its symbiont (Symbiodinium), for this amino acid, which is critical for its survival. 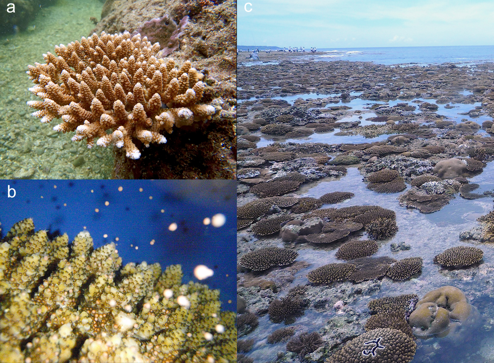 Corals inhabit environments where they are frequently exposed to high levels of solar radiation (see picture C), and the analysis of the Acropora digitifera genome data has found that the coral host can independently carry out synthesis of mycosporine-like amino acids, which are potent ultraviolet-protective compounds. Corals, jellyfish, and sea anemones belong to a group called Cnidaria. The analysis of the Acropora digitifera genome data has found that its innate immunity repertoire is significantly more complex than that of other kinds of Cnidaria, which do not host Symbiodinium. This indicates that the Acropora digitifera genes may have multiple roles in symbiosis or coloniality. A number of genes with putative roles in calcification were identified, and several of these are restricted to corals. This important body of research clearly indicates that the coral genome provides a platform for understanding the molecular basis of symbiosis and responses to environmental changes. This research was funded by the OIST subsidy for operations allocated by the Japanese Cabinet Office. The work was supported in part by Grants-in-Aids from MEXT and JSPS, Japan. The collaborators belonging to the two affiliations above contributed to this research. *2 ARC Centre of Excellence for Coral Reef Studies and School of Pharmacy and Molecular Sciences, James Cook University, Townsville, Queensland 4811, Australia. * Authors without annotations are all OIST researchers. (a) An Acropora digitifera colony. Photo taken in Ishigaki Island, Okinawa, Japan. (b) Natural spawning of Acropora digitifera releasing egg-sperm bundles. Sperm from a single colony served as the source of the genome sequence. (c) Corals exposed during low tide. Photo taken in Bise, Motobu, Okinawa, Japan. 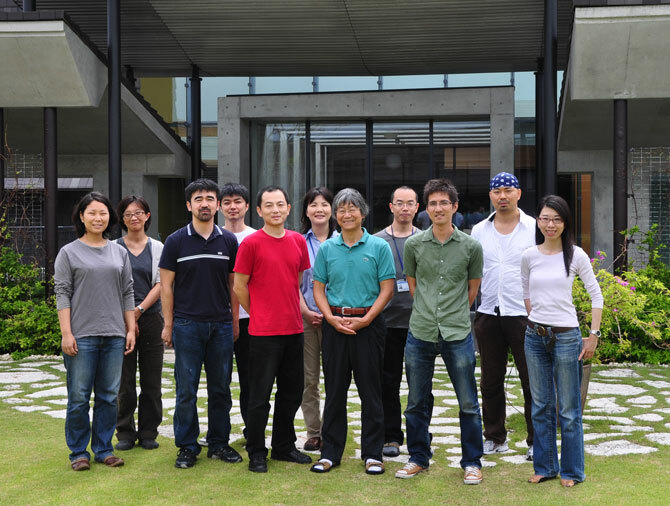 The purpose of OIST is to conduct world-class research and education in science and technology in Okinawa, to contribute to the self-sustaining development of Okinawa and to the advancement of science and technology worldwide. 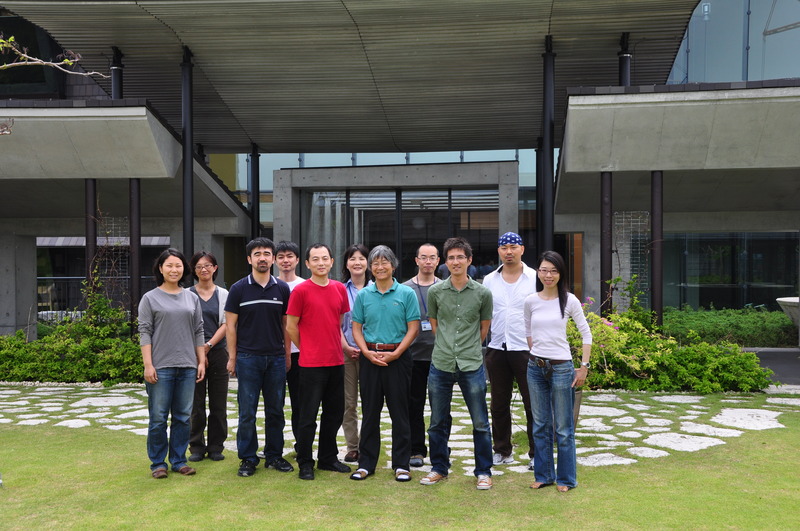 OIST currently has 35 research units (more than 190 researchers, of whom approximately 75 are international) carrying out multi-disciplinary research in neuroscience, molecular sciences, mathematical and computational biology, and environmental science. It has launched a program of international courses and workshops that have already achieved worldwide recognition. Full accreditation as a new graduate university is expected in November 2011.